Members of the Wokingham District Veteran Tree Association (WDVTA) are gradually working their way around the local area, recording all trees usually above a certain girth on a database. In Arborfield and Newland, many of these trees are oaks. One noteworthy example, known as Bound Oak, tree no. 4197 on the database, is so old that it has long since hollowed-out and decayed; however, in the second decade of the 21st Century, it was still alive as of May 2011 when the photos shown below were taken - see the WDVTA tree-record here - and still going strong as of May 2015.
in some places the lord of the manor was beaten. 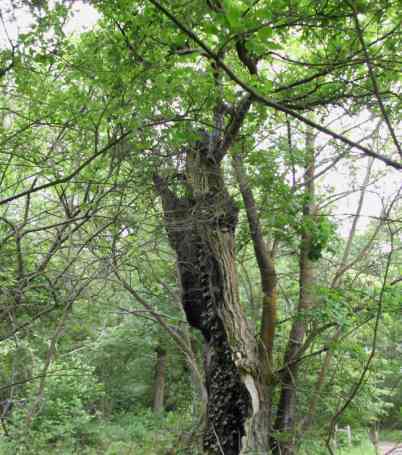 This oak stands at the end of a lane which may possibly have been a Roman road, and has that tradition, joining the Devil's High Way, which was an early British road running straight from Staines to Silchester, the latter being a very important Celtic and then Roman town. 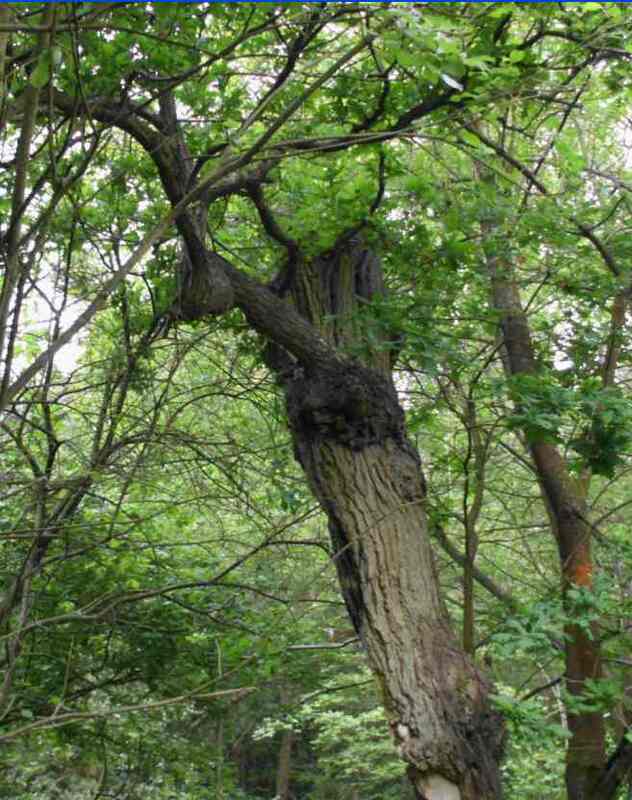 The tree can easily be found on the Ordnance Survey Pathfinder 1/25000 map as a local landmark (SU 75105 65615). On this portion of the map, the road running from south-west to north-east is the Swallowfield Road. Bound Oak is on the junction of Castle Hill and Wokingham Lane (off the map to the right). By the way, Westlands Copse has long since gone, as has the brick kiln opposite Tanners Farm. Notice just how many wells served the locality in the 1870s. As of 2011, two segments of the hollow trunk are lying on the ground. 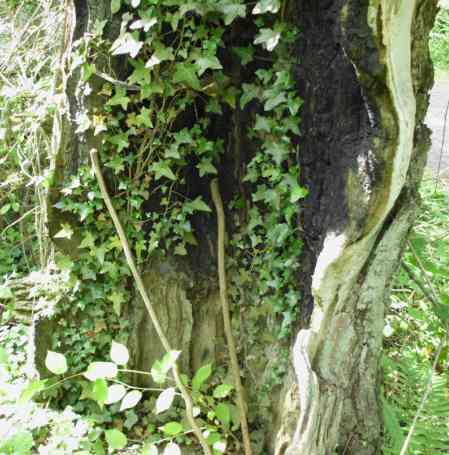 However, about a third of the trunk remains standing, as shown on the photo below. At least twice in recent years, fires have deliberately been started in the hollowed-out trunk. Ivy is now growing up on the inside of the trunk, as shown below. 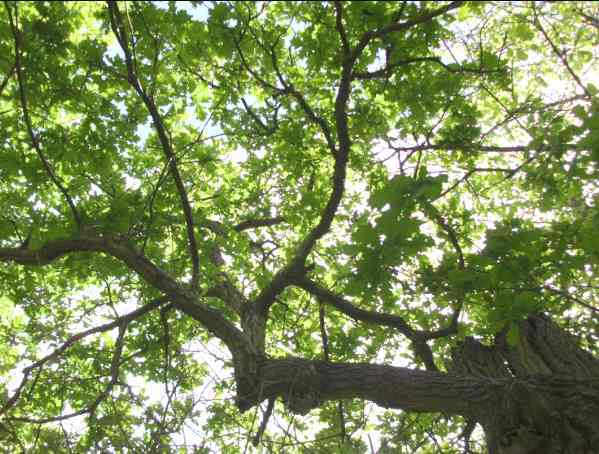 The next photo is looking upwards to the branch, clearly showing leaves growing from the old oak. Park at Arborfield Park in Swallowfield Road. Take the footpath past Chamberlain's Farmhouse and the thatched Applemore Cottage and behind Melrose Gardens through a small copse. Turn right up the hill and through the metal gate. Pass along the eastern edge of Arborfield Court and go through the next metal gate. Cross the field along the hilltop, then pass through two metal kissing-gates. Follow the footpath through Long Copse, well-known for its mass of bluebells in spring-time. Continue along the footpath until it reaches another metal gate. Turn right along Wokingham Lane. When Wokingham Lane reaches the road (Castle Hill), 'Bound Oak' is on your left. Cross the road and continue on the byway until it reaches Swallowfield Road. Turn right on Swallowfield Road and shortly afterwards, turn left along the track leading to the moated Kenny's Farmhouse. At the entrance gate to the old farmhouse, the path turns right and skirts a couple of fields. Follow this footpath along the southern edge of the field until it reaches 'Pound Copse'. Walk through Pound Copse (also a good location for bluebells) to the far end, then take the exit on to Greensward Lane. Turn left on Greensward Lane until it reaches the main A327 Reading Road. Turn right on Reading Road past Walden Avenue and Pudding Lane Nursery. Turn right along Pudding Lane, which will lead you back to Arborfield Park. This walk should take around an hour and a half. After skirting the large field: where a footpath is signposted to the right, instead go straight on. Gamekeeper's Cottage will be seen at the end of the next field, to the left of the path. 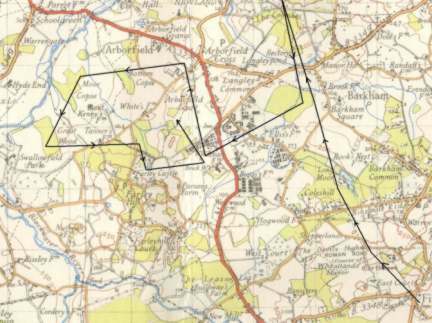 Ignore the track that passes Gamekeeper's Cottage (It's correctly marked 'Private', but on older maps it was marked as a Right of Way; as compensation for the track's closure, the Samuel family presented Pound Copse to the village). Continue straight over the track to the end of the next field. Follow the marked footpath past Bridge House to the main A327 road. Turn left across two bridges. The first spans the Mill stream, while the second passes over the original course of the River Loddon. Continue carefully alongside the A327 until just before the 'Magpie and Parrot', where a footpath can be seen crossing the flood meadow on the right hand side. Traffic along the main road is fast, so take care crossing over it. Climb the stile and follow the footpath diagonally across the field back towards the River Loddon. It can get quite waterlogged in winter-time and after prolonged rain. At the hedgerow on the edge of this field, take the stile and footbridge over the drainage ditch. The footpath now skirts the next field, aiming for the farm track in the far distance. The River Loddon is to your right. When the footpath meets the farm track, there is another stile to climb. Turn right over the river bridge towards the cluster of buildings for Arborfield Hall Farm. The old brick-built cow sheds are to your left, followed by Hall Farm House (now University accommodation). The cut-down mill building (now used by Thames Water) is to your right. Continue straight past the ruins of the old St. Bartholomew's Church and cross the new farm track that leads to the 'CEDAR' research centre. Go straight on through an avenue of horse-chestnut trees and pass between the farm cottages on both sides of the lane. The lane will eventually pass the Old Rectory and the current Rectory. Either turn right to meet the A327 and then left to reach the village, or continue straight on past the Rectory and the new St. Bartholomew's Church. Take the footpath on the right that skirts Cloud Stables and a field. It will eventually take you to the B3030 Sindlesham Road. Turn right towards Arborfield Cross; keep to the right until you reach the slight bend, and then cross over and walk along the left-hand verge to Newland Farmhouse. Finally, cross over to the cottages facing the roundabout and on to Swallowfield Road; the park entrance is on your right after 200 yards. In 2011, cuckoos could regularly be heard along most of the route - at least three at the same tim e. One was even spotted immediately behind Melrose Gardens, although it was too elusive for the camera. 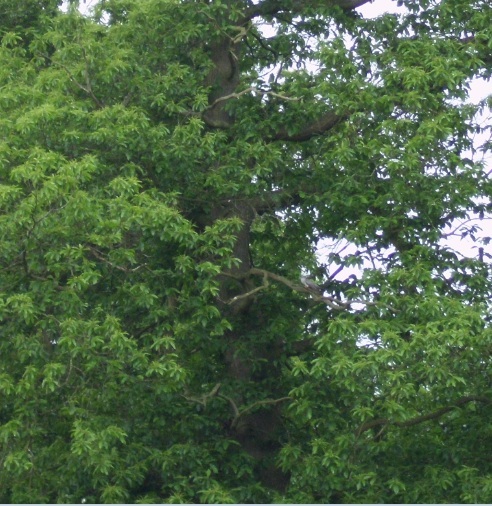 However, cuckoos could also be heard on the other side of the village a day or so later, and one was successfully photographed in the field adjacent to Bearwood Lakes Golf Club, well-camouflaged against the sweet chestnut tree branch. Cuckoos have been heard every year since - including 2015. The Garth dog pack met on Wednesday, at the Greyhound, Finchampstead. ... One fox crossed the road and ascended the steep hill. Leaving the church on the right, hounds ran their quarry over the Nine-mile-Ride, through Longmoor, over to Kidgham and by Barkham, over the road to the Coombes into Bear Wood, where they were run out of scent. Hounds cast about in the Coombes, hoping to pick up their hunted fox, but failing this, they came back to Barkham and drew Kidgham through. The next draw was the covers near the Arborfield Remount, and a fox was soon found, which led hounds away with a merry cry round Whitehall and Westlands. Leaving Arborfield Cross on the right, he crossed the road pointing for Moor Copse, then bearing left-handed went on to the Swallowfield Park covers, then re-crossed the road, running with some delightful music through the Farley Hill covers. Keeping to the left, he ran on by the Bound Oak towards Farley Castle, then turned back by Westlands and Whitehall, to be killed in the open on the hill between the Bound Oak, Farley Hill, and Arborfield, after a really good hunt. The Garth dog pack met on Thursday, October 5th, at The Bound Oak, Farley Hill, at 8 o’clock. Out during the morning were Major Sir Herbert R. Cayzer, Bart., M.P., the joint Master, Mr. Cayzer, Miss P. Cayzer, Miss E. Allfrey, Mrs. E. M. Sturges, Mr. Vivian Simonds, Miss P. Simonds, Mrs. G. Simonds, Major Edwards, Major Tanner, Lieut.-Colonel F. G. Barker, ex-Master, Miss Effie Barker, Mr. Pither, Mr. Simonds, Miss Ravenscroft, Miss Joan Ravenscroft, Mr. Ben Green, Mrs. Vere Allfrey, Mrs. Anderson, Mr. Hedges, etc. Westlands was blank. The next draw was Mr. Allfrey’s covers in Farley Castle Park, and then hounds proceeded over the road into the Big Wood. A view holloa was heard back towards The Bound Oak. Hounds ran towards Long Copse, and the fox turned short back and through Farley Castle covers, and was viewed over the top part of Farley Hill back into the Big Wood. Later hounds got well on the line, running round Hemmses with quite a good scent and a splendid burst of music, and seemed quite close to the fox at times. Eventually he broke away over the old lane, and ran round the Big Wood and got to ground just on the top part of the Big Wood. At Farley Hill Place a fox was found, which led hounds over to the lower part of Wyfolds. Hounds then drew all through Wyfolds, the gravel pits and gorse by Mr. Bowyer’s farm, and then Wheelers, and after a time a fox was on foot. Hounds hunted him round the cover and then across from Wheelers into Wyfolds, and back to Wheelers again, but scent seemed to fail.